The 1203BB DC Motor Speed Regulator controls the speed of a DC motor by adjusting Pulse-Width-Modulated (PWM). It provides a continuous current of 3A to your DC motor or other DC load. Besides, the circuit also includes a 3A fuse, with reverse connection of power supply and control the forward or reverse direction and the stop of DC motor by switch. - Size: 5 * 3.2 * 1.5cm. - The input power range is DC6-28V. 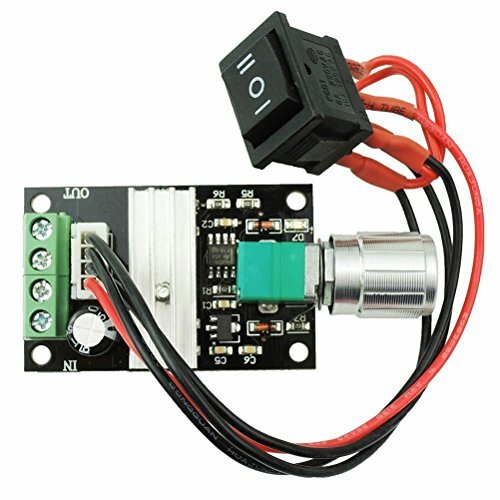 - Control the forward or reverse direction and the stop of DC motor by switch. - Potentiometer with switch function. - The switch cable length 15cm. Before you attempting to wire the controller, make sure that the power is off. 1. Connect wires refer to the wiring diagram. 2. Turn on the power, and adjust the potentiometer. 3. The LED indicates the power up and the speed of motor. Warning: Do not reverse positive and negative power loads. This will damage the controller!